French lotions, hand creams and body creams by Pre de Provence | P.C. 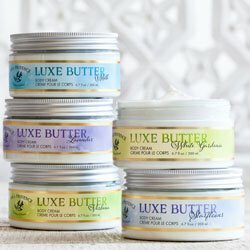 Fallon Co.
Pre de Provence creates rich lotions and body butters to leave your skin perfectly moisturized and protected by their unique blends with natural, skin-pampering ingredients including Shea Butter, Vitamin E, and Olive Oil. Choose from several lines including the Shea Butter line, Argan Collection, and the Private Collection with fresh fragrances including Amande, Starflower, Mint Leaf and Lavender inspired by the distinctive flowers, herbs and fruits of Provence. All products made in France.